I believe every boy who has a Matchbox® or Hot Wheels® car would love to know just how fast their car is going down hill. In this case my son and I wanted to know this going down our stairs on the classic orange track. After some research, I found a way using an Arduino Uno. This is a mega post so read on! The setup is straight forward and the real help came from Mark’s post here. 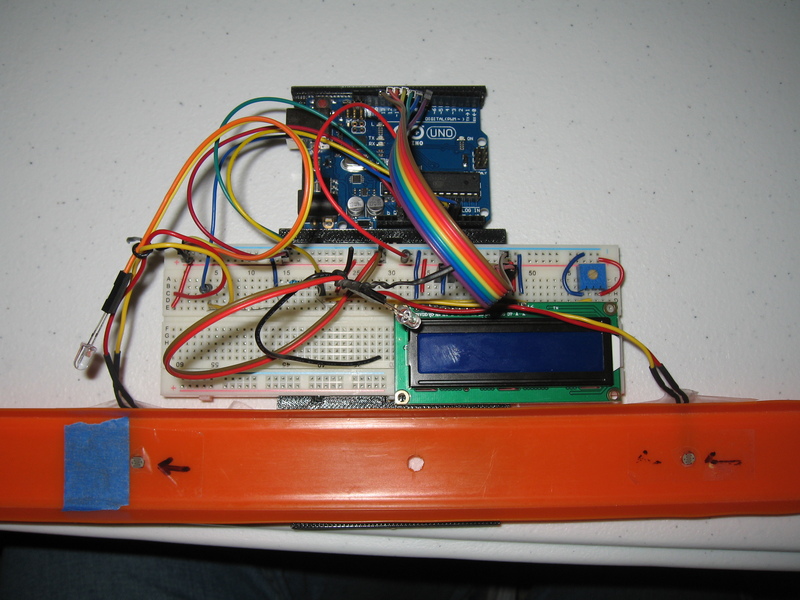 Mark used a couple photo-resistors to setup a speed trap for his model trains. 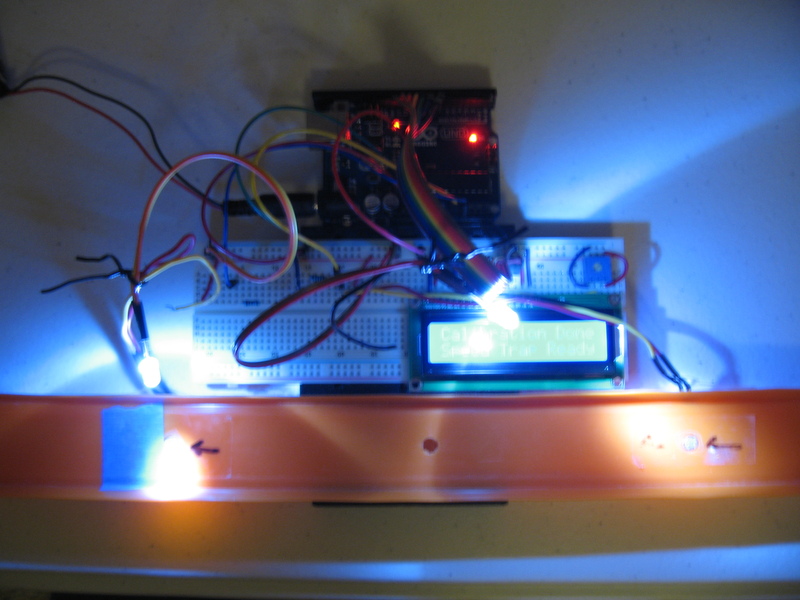 Starting with Mark’s setup, I added a couple white LED’s and a 1602 LCD to provide data. The LED’s make the photo-resistors more responsive and less susceptible to shadows when moving over the sensors. The setup is straight forward with the diagram below. The sketch / code for the Arduino is fairly easy (most of it is comments for others to understand and modify for future needs). * Attribution-NonCommercial-ShareAlike 3.0 Unported License. * Many thanks to Mark's post!! Once everything is loaded up and checked out, the LCD will report calibrating. This is the code recording the photo-resistors level with the LED’s, then the sensitivity is set to 25% of that level. This makes the photo-resistors react well when a car passes over them. Note the photo-resistors are spaced 20 cm (0.2 m) apart. During testing, they were initially 10 cm (0.1 m) apart. This worked well with slower cars; however, faster cars couldn’t be timed accurately. The larger space increases the time between the photo-resistors, and the accuracy. Once calibrated, running a car right to left (as seen in the pictures above) the LCD will report speed and the average speed. 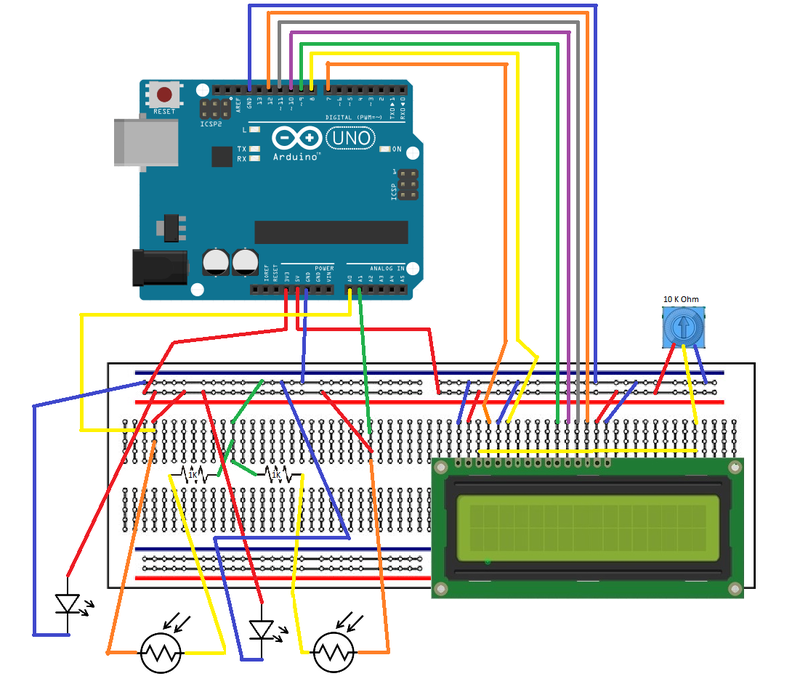 If you use the serial port monitor with the Arduino connected to a computer, the output will include average speed and trap times. 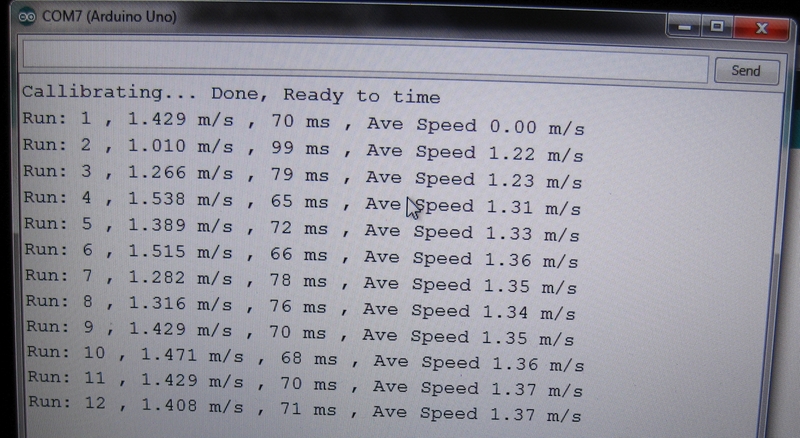 Making it handy to repeat speed tests to reduce uncertainty and get better statistical data. Car speed is just one part of the equation, the other part is using it practically. Using the diagram below we can figure out the forces and friction acting on the car with the physics & equations below. In the test setup above, the 35 gram toy car from a stop, is measured to have a velocity of 4 m/s after rolling 1 m down the track at a 40° angle. To find the friction we need to determine all the forces shown above. Ffriction is the friction force resisting the car from rolling down the track. To determine the friction forces, we need to determine Fnet. 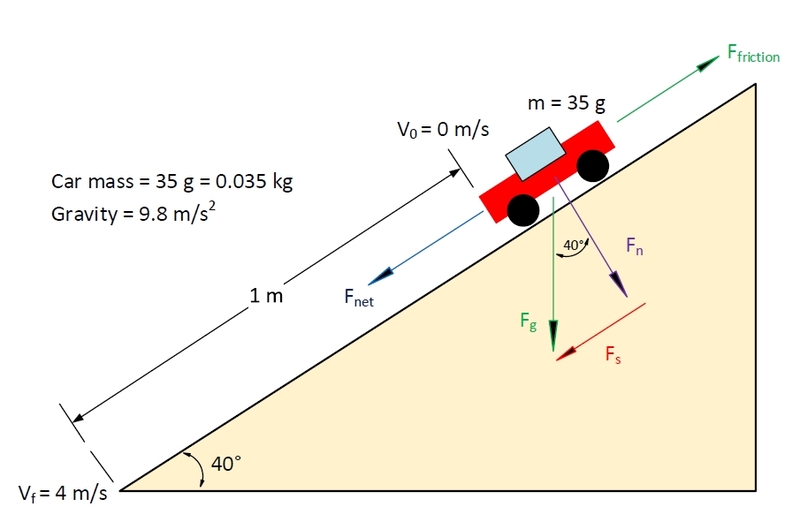 Knowing the starting and final velocity, we can determine the toy car’s acceleration, and then using F = ma, find Fnet. Thus the friction forces acting on the toy car total 0.080 Newtons. The total friction forces include rolling friction as well as drag from moving through the air. These values depend on many factors like surface area, contact materials, and loading – we won’t go into that here. So to conclude this massive post, we have a speed trap to get speed, and the physics to support finding additional data for testing and fun! The setup could also be modified to be on two tracks and with some code changes to see which car arrives first (think a drag race). If you have made it this far down, thanks and I hope you enjoyed the post! Download link below is a ZIP file containing the sketch file, Visio file with diagram, images etc. (handy for other science projects and work). Teachers/Instructors/Students if you use this please let me know with an email (no legal stuff, would like to know if this is handy). Click here to get the file.